We know you would like HD quality content distributed around the home or business from a single point like a blu-ray player and Foxtel box, so what’s the best way to do with or without a HDMI cable? Renovating or building a new home or office can be expensive, these no doubt about that, setting up your equipment the right way also has no exception, but hey, there are ways to save a few dollars in the long run. Saving the expense of having multiple Blu-ray players or even Foxtel boxes and have it distributed throughout the house or office is the way to go. Equipment you’ll need will vary depending on your situation. 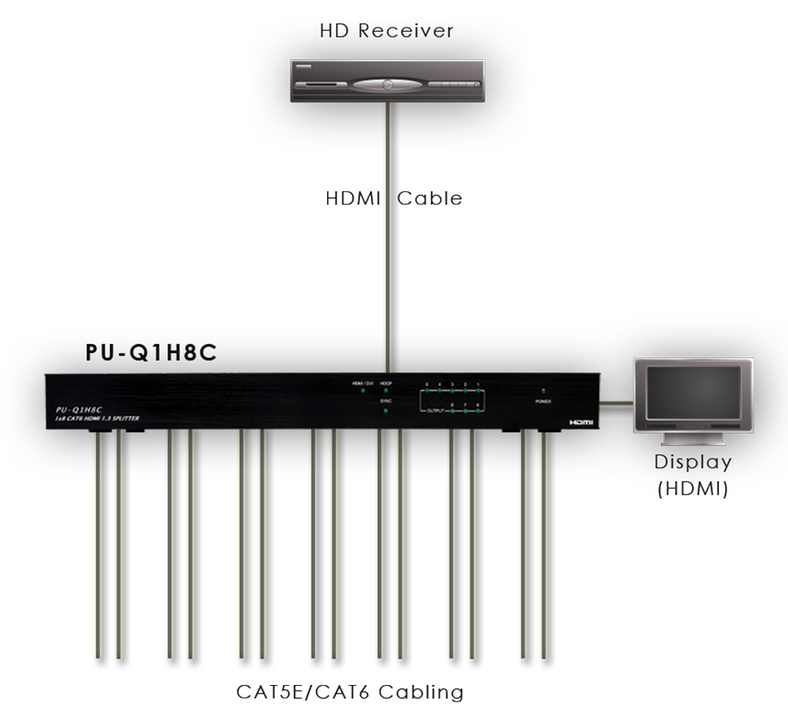 There are a few different ways that this can be setup and we’ll run through all the different solutions for you based on performance rather than cost as performance is our main aim and result, all there option will also has a built in IR extender so you can start/stop/pause/change channel ect from the TV you’re watching to the piece of equipment you want to control in the other room. First off you need to know that a HDMI lead by its self will not work at long lengths, anything over 15 meters and signal starts to drop off, at 20m to 25m you’ll see errors on the screen, check out of blog on HDMI cable for more information about HDMI leads. So the for our first option, if you want to go from one room to another only, if you want to run a HDMI signal to, let’s say a bedroom from the lounge room and the distance is not very far, a normal HDMI cable will work but then you’ll need an IR extender to work with it but for a much better solution we can use a HDMI to cat5 converter. Basically this is changing a HDMI lead to a Cat5 lead (computer data cable) and then back to HDMI, there are a few on market and the one we’d recommend is one that has an IR extender built in, yes you can get wireless IR extenders as if you were only running a normal HDMI lead, but a hardwired solutions is always best and plus having a wireless system alongside a hardwired system is an extra piece of equipment you don’t need to have and there are too many IF and BUTS that could happen with wireless. Our second option for you is if you want to run to more than one bedroom, let’s say 3 or 4 bedroom, and a games room for example, you have the option of using a HDMI to cat5 splitter system. So how this system works is basically the same as the first option but we’re splitting the signal to more TVs at the same time, the main unit, the brains of the system I guess you can say is physically bigger and all the data cables need to run back to this main unit. Again there is another little box at the TV to change to data cable back to HDMI, depending on which system you get, it can have an IR extender system built in as well which is what we’d recommend for simplicity. This was part 1, part 2 is right here. 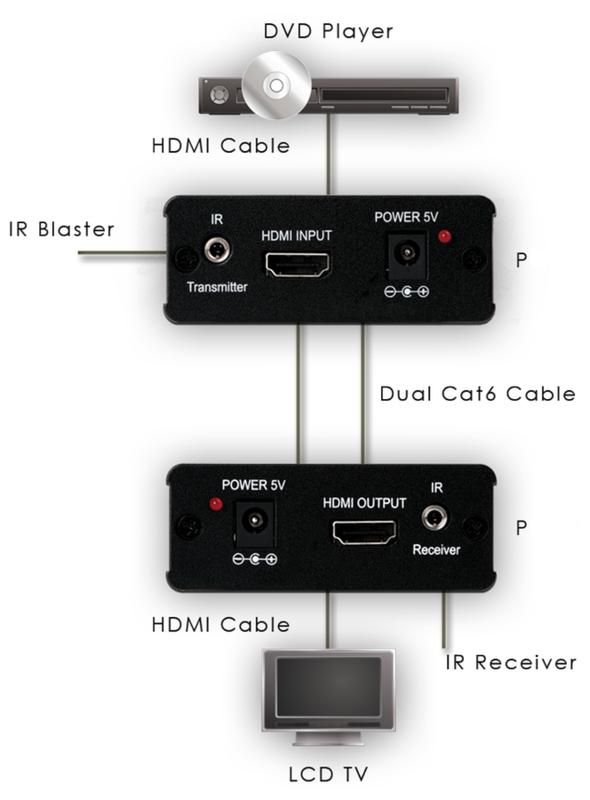 We still have another 3 different solutions to show you about transmitting HDMI over a long distance.